Yahoo has officially announced, they are looking for New CEO and Jerry Yang is stepping down from CEO position and will return to it his Former role as Chief Yahoo! & Board Member. Yahoo! Inc. (Nasdaq:YHOO) today announced that its Board of Directors has initiated a search for a new Chief Executive Officer. 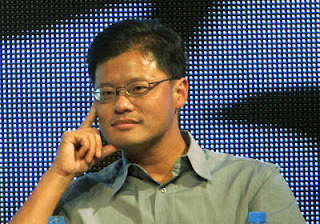 Jerry Yang, co-Founder of Yahoo!, has decided to return to his former role as Chief Yahoo! upon the appointment of his successor as CEO, and he will also continue to serve on the Board. Yang, 40, assumed the CEO role at the Board's request in June 2007, and he has led Yahoo! through a strategic repositioning and transformation of its platform." There is mix reaction over this news in industry moreover this news is much interesting to watch reactions from Yahoo Share Holder's on "I strongly believe that having transformed our platform and better aligned costs and revenues, we have a unique window for the right CEO to take ownership over the next wave of mission-critical decisions facing the company." which he has written in his Memo to Yahoo Employee's about his decision. BoomTown has obtained the entire memo from Jerry Yang to his employees at Yahoo about his plans to step down as Yahoo CEO. You can read Jerry Yang's last email as CEO written to Yahoo Employee's about his decision on step down.